God Brought Me Here For A Reason: Awake! What's next then? 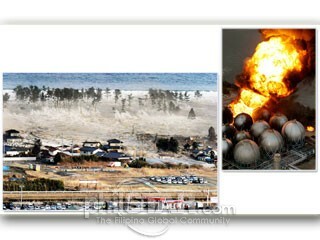 Japan, one of the Asia's progressive countries was not spared to the nature's wrath! I saluted how Japan gave emphasis to doing and making things based on what is standard. However, some of their affected architectural designs that were earthquake proof were now torn down into rubbles. So sad. Unlike the 9/11 Terrorist Attack in the land of milk and honey, this land of striking scenic beauty was shaken not with human factor but with nature. This is a wake up call for all of us. In the Science point of view, the Mother Earth is slowly deteriorating and very much vulnerable to natural destruction. But all of these occurrences were already predicted even before these were preconceived by any human minds in our generation. This was already revealed in the Holy Bible, the very Word of our Almighty God, the Creator. 4 Jesus answered: “Watch out that no one deceives you. 5 For many will come in my name, claiming, ‘I am the Messiah,’ and will deceive many. 6 You will hear of wars and rumors of wars, but see to it that you are not alarmed. Such things must happen, but the end is still to come. 7Nation will rise against nation, and kingdom against kingdom. There will be famines and earthquakes in various places. 8 All these are the beginning of birth pains. Wars, famines, earthquakes? They are all happening now. And these are JUST THE BEGINNING. The crisis in the Middle East, the tsunami threat on Japan's neighboring countries and the shortage of food supplies that the world experiences right now have just started. Let us all be aware. If we do not read His Word, we will have no idea about the truth. We could just simply blame it to the global climate change. Somehow, they are inter-related. As for me, the Science has just uncover what was written in the Bible thousands of years ago. But all these things shall come to pass as we expectantly be waiting for the coming of Our Lord Jesus Christ. Let us keep ourselves alive, alert and awake with His Words.